SUMMER TIME IS FAMILY TIME ON BLUE PASSION... KIDS SAIL FREE! 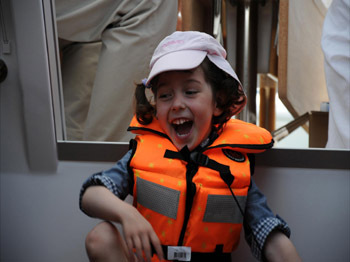 Any child aged 12-years old or under may sail for FREE this summer aboard the charter yacht Blue Passion. Bring the kids and have a wonderful family sailing vacation! RATES: Special offer is for a 7-night (or more) charter with two adults. 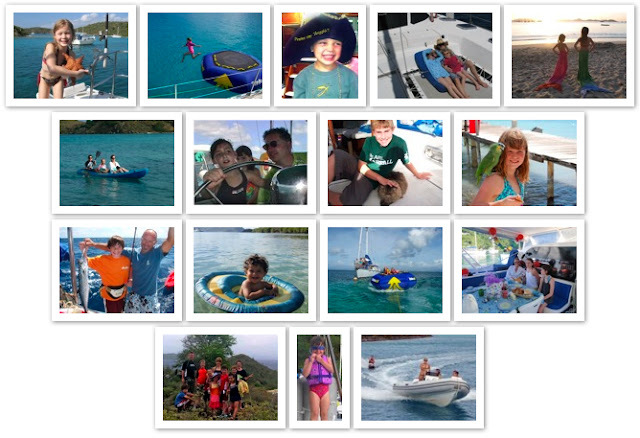 Up to 5 children may sail free per charter. 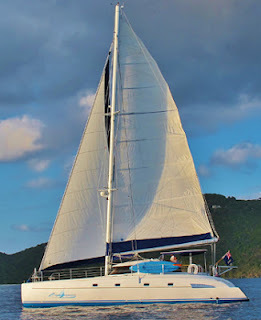 OTHER SPECIALS: Can be combined with Blue Passion's other special offer of 10% discount or charter 9 nights for the price of 7. 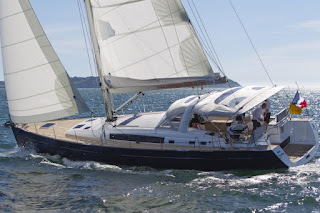 Blue Passion is a 58-foot Beneteau (Oceanis 58) sloop with an owner-operator crew of two. Blue Passion is fully air conditioned and accommodates up to 8 guests in 4 cabins, each with private, ensuite heads/showers. The aft, starboard guest cabin can be either a queen or split into twins (see layout diagram in the yacht's ebrochure). 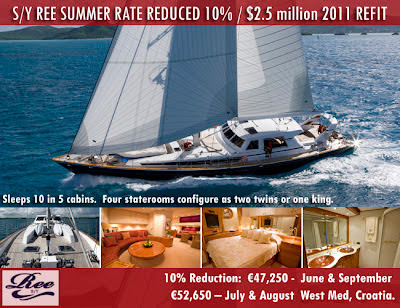 $1000 off any 7-night (or more) charter confirmed before November 1, 2012. 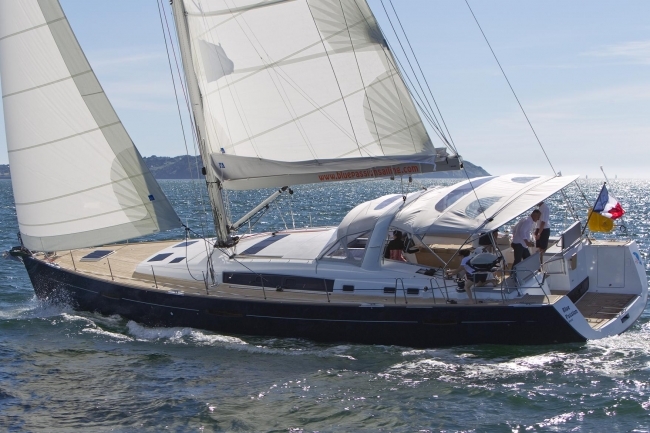 Magic Inspiration is a 46-foot Fountaine Pajot catamaran with an owner-operator crew of two. Magic Inspiration is fully air conditioned and accommodates up to 6 guests in 3 Queen cabins each with ensuite head/shower. 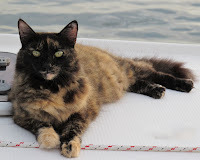 They have a 12-foot dinghy with 25HP outboard, tube, wakeboard, two 1-person kayaks, boogie boards, noodles, TV/DVD, etc. 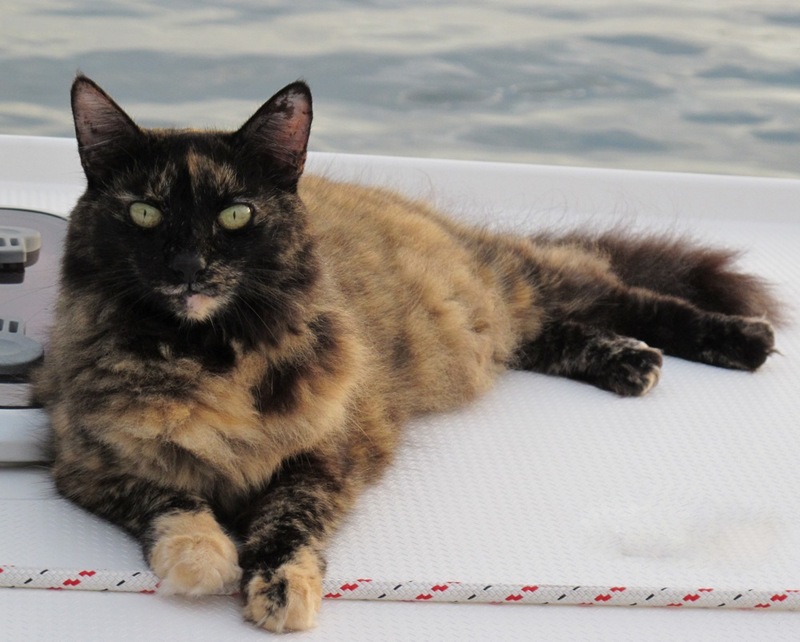 Mango, ship's cat, is a low-key feline and is not allowed into the guests cabins during charters and off charter as well. Please note that Magic Inspiration is a smoke-free boat. Jeff, Sandy, and Mango are looking forward to welcoming you aboard! 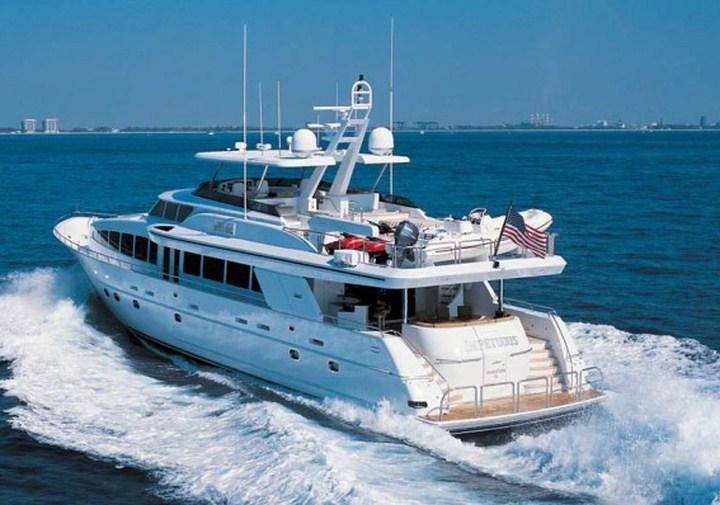 The charter yacht Impetuous, a 120-foot Crescent motoryacht, will be available for yacht charters in New England this summer. 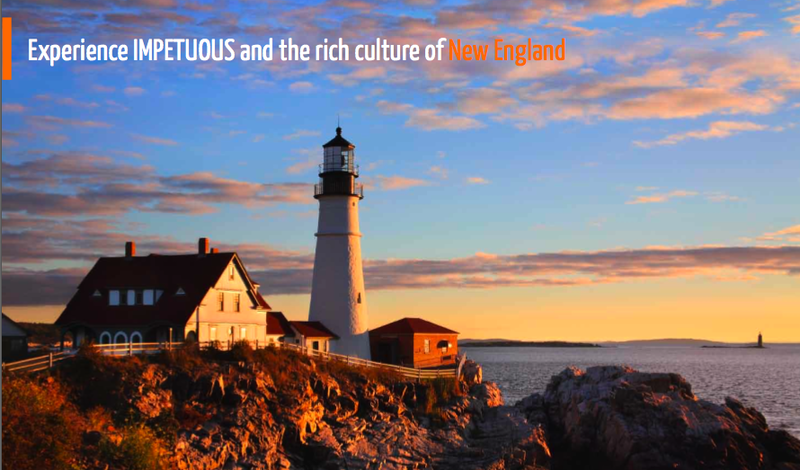 Impetuous looks forward to welcoming you aboard for an unforgettable New England cruise, taking you to a region rich in American history, culture, and natural beauty. Charter yacht Impetuous has sent us a sample itinerary for New England, that you can see here. 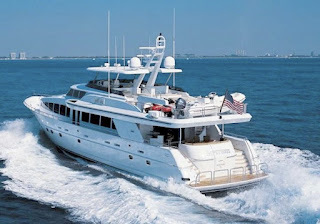 The charter yacht Impetuous, a 120-foot Crescent motoryacht, has sent us their sample itinerary for yacht charters in New England. Arrive in Newport, Rhode Island to meet your yacht. Newport has opulent mansions to tour, countless historical buildings and sites, and a beautiful coastline that ranges from white sandy beaches to rocky surf. While you’re there you can experience as much or as little as you would like; fine dining, shopping, walking tours, cozy cafés, all within a historic seaside village. Depart for Edgartown, MA. Edgartown was settled in the mid 1600s, making it the island’s first colonial community. Today the seaside village attracts year-round visitors to its stunning beaches, bountiful recreational activities and unique New England ambience. Outdoor enthusiasts appreciate South Cape Beach State Park, where sunbathing, fishing, swimming and hiking are popular pastimes. History buffs are intrigued by Martha’s Vineyard Historical Society Museum, which features historical objects, maritime artifacts and genealogical collections that depict the lives of the area’s inhabitants from 10,000 years ago to the present. Those looking for a unique coastal getaway easily fall in love with Edgartown’s Greek Revival architecture, fine dining restaurants, and trendy shops, ingredients that blend together to produce a charming charter destination. Depart for Nantucket, MA. An island of pristine beauty 14 miles long and 3.5 miles wide, Nantucket is a haven 27 miles out to sea with something to offer everyone. Experience the hustle and bustle of downtown by enjoying a meal at any one of the numerous fine dining establishments, lose yourself in the art galleries along the wharf, stroll through the museums and historic sites or pick up some island treasures at any of the many boutiques and shops in town. With over 80 miles of beaches, it should not be too hard to find your own private stretch of sand along Nantucket Sound or the Atlantic Ocean. Depart for Hyannis, MA. The exclusive resort community of Hyannis perhaps derives its greatest measure of fame from the Kennedy clan. As early as 1925, the dynamic family began to make its mark on the village and then the nation, and today, strengthened as it is by tragedy, it’s respected, beloved, and treasured by neighbors in Cape Cod. In fact, throughout Barnstable; the town which encompasses Hyannis and six other villages, can be found landmarks and remembrances that acknowledge the Kennedy presence. Notable among them are the JFK Memorial, with its landscaped plaza and plaque, and the JFK Hyannis Museum. Cape Cod itself is a peninsula that juts 100 miles into the sea. Hyannis lies on the formation’s southern coast and looks south towards Nantucket and Martha’s Vineyard. Known as the ‘All-American City’ it is home to delectable fish shacks and award-winning restaurants, world-class beaches, the island ferries, countless outdoor activities and Cape Cod’s most unique shopping. 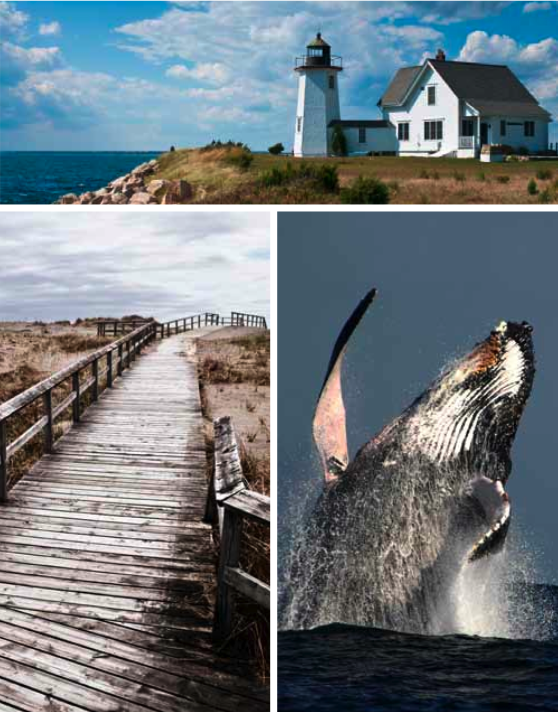 The Town of Barnstable and immediate surrounding area nurture the unbridled beauty of the Cape’s historic district, while promoting the family-friendly fun of “Main Street, USA”. Depart for Vineyard Haven, MA. The seaside village of Vineyard Haven, which is also known as Tisbury, is the main entry point to the island of Martha’s Vineyard. Nestled in a cove that was once the site of a prominent whaling station, this town is a popular summer vacation destination, but attracts the adventurous year-round. Although many of Vineyard Haven’s historic buildings were destroyed by fire in 1833, there are several historic homes that survived and continue to stand proudly on William Street, overlooking the harbor. 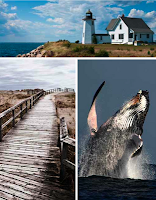 You may choose to visit the Martha’s Vineyard Seafaring Center, a museum that showcases historical maritime artifacts such as whale teeth and a life-jacket from the Titanic. Recreation abounds in and around Vineyard Haven, with the Manuel F. Correllus State Forest being an activity hotspot. Depart for Block Island, MA. Block Island definitely moves at its own pace and is known for a relaxed way of life. It’s where “dressed up” means a pair of shorts. Islanders speak of going to the mainland as going “off island” — an expression of the feeling that Block Island is its own entity, as unique as the North Light or the 250-foot bluffs! Return to Newport, RI for your departure. 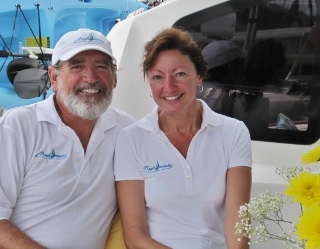 The charter yacht Ree, a 112-foot Valdettaro sloop, has reduced their summer rate by 10%. s/v Ree is a 112-foot Valdettaro sloop, with a crew of six is available for sailing vacations in the Mediterranean this summer. Ree is fully air conditioned and accommodates up to 10 guests in 5 cabins, four of which can be configured with either one king or two twins.